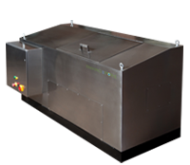 The EnviroPure Food Waste Diversion System by Air Cycle is an organic, self-contained, continual feed system that has been designed to transform food waste into a greywater effluent that can be safely disposed of into existing municipal water systems. The system is a great fit for any commercial kitchen operation such as hotels and schools. EnviroPure eliminates transportation costs for food waste, reduces janitorial labor and supply costs, and creates positive environmental impacts. EnviroPure handles virtually any type of food waste including vegetables, fruits, meat, fish, poultry, dairy products, bones, shells and pits, with complete decomposition typically occurring within 24 hours. The system creates a positive environmental impact and is low maintenance with no odors, no sludge buildup, and no clean outs.